Convert PDF is a desktop application that allows you to quickly and accurately convert PDF files to MS Word documents, MS Excel tables, rich text documents, plain text files, images, HTML files or SWF files for editing. 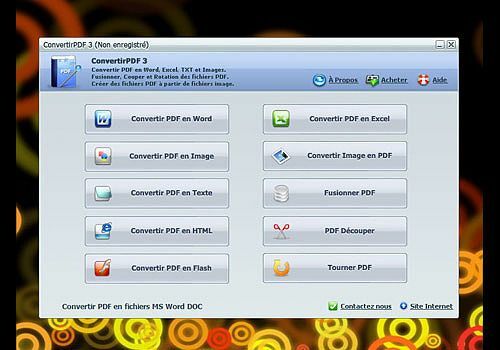 Convert PDF allows users to rotate, truncate and merge PDF files. addition, the software can convert PNG, TIF, BMP or JPG images to PDF files, which means that users can easily create PDF files from images. Convert from PDF to MS Excel format so you can edit and extract PDF forms. Convert PDFs into rich text files. You can then modify texts and graphics with Windows Wordpad. Convert PDFs to plain text files. You can then edit the texts with Notepad. Convert PDFs to HTML files and automatically generate Index files. Convert PDFs into Shockwave Flash Animation files so you can publish them on websites. Create a PDF file from JPG/PNG/TIF/BMP/GIF images etc. Change the start options for your PDF file. You can then decide to hide toolbar and menubar, show the document title etc. With "SoftOrbit's PDF Logo Remover" you can get rid of annoying watermarks, backgrounds and unwanted photos of PDF documents.